Is it possible to stream MKV over DLNA? DLNA, stands for Digital Living Network Alliance, is a non-profit collaborative trade organization established by Sony in June 2003, and now it becomes an industry-wide standard for sharing data over a home network. You are able to stream films, pictures and files from your laptop to your TV and HD media players via DLNA, sharing media content with family members and friends. Here will simply discussed about how to convert MKV to H.264 MP4 for streaming over DLNA? While not all video or audio files can be streamed over DLNA such as MKV. Some people claim they can successfully play MKV videos on HDTV via DLNA, while others can't. Why this happening? MKV is not one of the media options that are categorized because it's not a sanctioned format (not like WMV, MPEG, etc.) Besides, MKV is a flexible container format which can store just about anything (H.264, DivX, MPEG, any sort of audio, even menus and subtitles) while WMV, MPEG is more or less complete formats so they know what to expect while with MKV's you really can't tell without checking the contents itself. In that case you're suggested to convert MKV to DLNA sanctioned format, e.g. H.264 MP4. The following guide tells you how to convert MKV to H.264 MP4 video with AAC audio included. How to convert MKV to H.264 MP4 for streaming over DLNA? Step 1. Free download a MKV to MP4 Converter. Pavtube Video Converter is a professional video converting and editing tool which aims to convert regular videos (MKV, MP4, AVI,...), HD digital recordings (MXF, MOV, MOD, TOD,...) and DVR (TiVo, DVR-MS) to other video formats for iPad, iPhone, Nexus 7, Galaxy Note 10.1, WDTV Live, Dune HD Player and more devices. Load file or folder into Pavtube Video Converter using "Add video" or "Add from folder" button. Step3. Choose DLNA compatible media format. 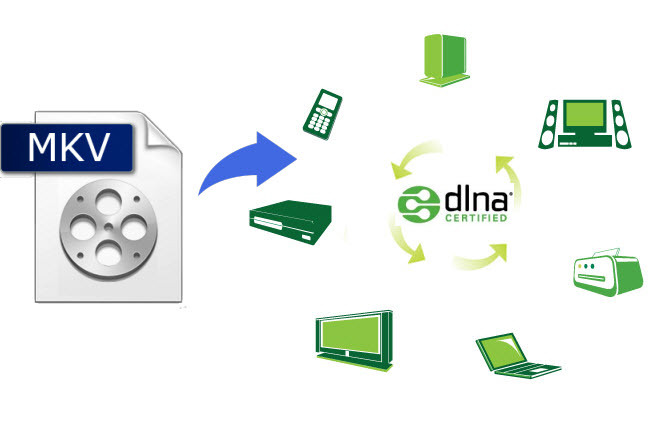 DLNA applicable required formats include MPEG2, MPEG4, H.264 and WMV9. H.264 is recommended as a top choice for achieving very high data compression while maintaining good video quality at bit rates that are substantially lower (e.g., half or less) than what previous standards would need. In Pavtube Video Converter you're advised to follow "Common Video" to choose H.264 MP4 format for video streaming over DLNA. If the source MKV is 1080p or 720p high definition video, you may follow "HD video">"H.264 HD (*.mp4)" video to get best video quality and AAC 5.1 sound. Step4. Start MKV to H.264 MP4 conversion. Click the big "Convert" button and start the MKV to H.264 MP4 conversion. When it completes, back to Pavtube application interface, click "Open" icon and find the converted H.264 MKV video for streaming to DLNA certified TV or HD media player. After that, you can have the compatible HD MP4 videos for enjoyment no matter you want to playback them on your TV or stream them to your protable devices, all those can be realized under DLNA, and no need to worry about the compatible problem about this MKV format.